Quinoa is an interesting texture. The mixture I got the other day was Quinoa and brown rice with olive oil and spices. The spices didn’t thrill me, but today I added a bit of mustard and it was quite tasty. I’ll have to figure out a better spice mix. I’ve switched from a short Yoga/Tai Chi exercise regiment to 20-30 minutes of yoga and strength training and balance games on the Wii Fit. Figure that’ll do more good than what I was doing, docs keep telling me I need to build muscle to protect my joints. Also, it’s more fun. I do need something solid to go under the board though, the carpet confuses it. Either that or I really did lose 12 pounds in one day… but the bathroom scale disagrees to the tune of 20 pounds, so. Financial year is nearly over at work, hurray for the stress of trying to do last minute catch up. We are going to meet several of our goals, but others… not so much. It’s just never enough. Ah retail. I applied to two jobs this week. One doing data entry at a place that helps people and one as a proofreader for Mongoose Publishing. The latter of which seems more likely to work out, as they already emailed me back with details and I’ve expressed my continued interest. So, that will be cool. Back on the yoga, tai chi, and meditation train, as well as working harder to eat better. Yes, I still have more Girlscout cookies to go, but I’ll be better about rationing the rest. Gotta have some incentives. Spring is definitely here. 80 degree weather this week. And tornadoes. Mustn’t forget the tornadoes and hail on Sunday. But the birds are happy and the grass is green. I have even opened the blinds and turned on the AC. Posted by Hydy in photos. I’ve spent a fair amount of time on WoW lately, and I just wanted to share with you why. 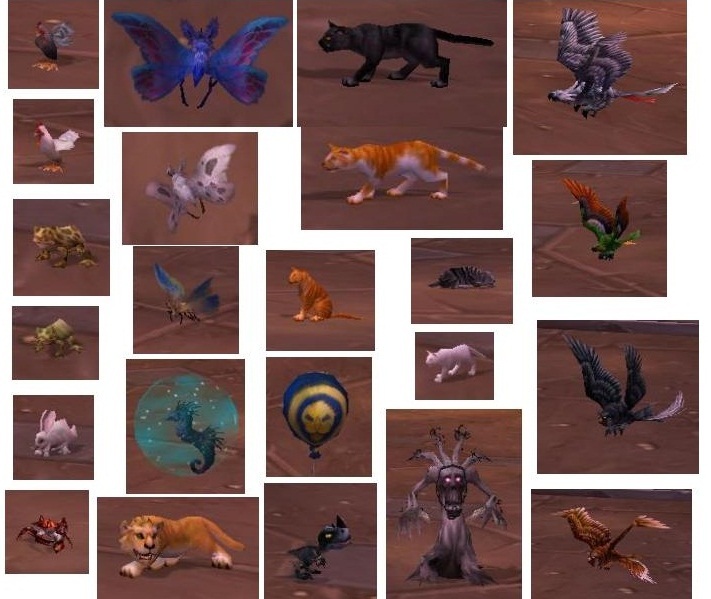 These are the 23 pets I have collected so far, and no, they are not shown in their correct respective sizes, but the size at which I could capture them easily on screen. The Treant is the largest, and is in fact about twice as big as my gnome character. So, not much more to report. Weather steadily heading towards spring. Just two more calendar weeks to go. My boss declared is spring today because she saw a bunny. Managing to stay ahead of the flu and such going around that the state health board has been calling our store to warn us about. Fighting off a cold this week and ducking strep. Just about done with The Omen Machine, by Terry Goodkind. I’ve just a couple chapters left, in his usual, hurry up and solve everything quickly after dragging it out over the rest of the book. The story is interesting, all our favorite characters are back. But the writing is just bad. Redundancy is the most prevalent problem. He keeps repeating himself, not just because similar things are happening, but paragraph after paragraph. It’s just odd. I really want to go back and re-read Wizard’s First Rule to remind myself why I really liked his books. But Amy still has my copy. This week is the Darkmoon Faire in WoW. Basically a carnival. I worked very, very (some might say ridiculously) hard to do ALL of the trade skill quests (except archaeology), so I could get enough prize tickets for a lion cub pet. He’s so cute! I also fished a sea pony pet off the docks. 🙂 I haven’t managed a sea turtle yet, but I keep trying a little here and there. Wondering if Rich wants to run dungeons and battle grounds to get me more tickets as don’t like those things. There are so many pets and mounts to buy with tickets, but they’re expensive. Heading to a party in Cleveland this weekend with friends. Should be a good time. St. Pat’s next weekend. I miss Ireland. One of these days, I promise, I’ll make it back to WarpCon. Further into The Omen Machine, and again, while I love Goodkind’s characters, and the plot isn’t a terrible one, the writing in this book leaves much to be desired. It’s disappointing. One more medical bill down, two to go. Have to get the next one sorted on Monday when the billing lady gets back to the office. The big one seems to still be in limbo, no letter or call from the medical collections agency yet. They didn’t have the bill when I called. Got a random collection letter on a 9 year old Sprint bill out of the blue. That’s taken care of, just wow, took them long enough. Weather is still really weird. Thunder and tornadoes and 70 degree weather in February. What will March bring?